I just finished up a day making Collagraph prints with a group of students, 124 five and six year olds..., at Newton College here in La Molina Peru. Collagraphy printmaking is a great, and very approachable, form of printmaking for younger students and older alike. It is kinetic and gets the students moving. Similar to relief printmaking but rather than taking away material to create an image you are adding material to a hard substrate to build up an image. So what do you need? 1. Two pieces of a hard substrate. We were making flags so I used a roughly 2' by 3' piece of plywood but it can be smaller or bigger. 2. Some cardboard, foam, bubble wrap Really anything with texture. The only caveat is that you want to try and keep your materials roughly the same thickness. 3. Some paint. I used student grade tempera and acrylic paint. 4. A staple gun or glue. I prefer using staples as you do not need to wait for the glue to dry. 5. Either paper, cloth, old sheets, or even T shirts. For this project we used pillow cases to make flags for each homeroom. 6. Brushes, the cheaper the better. First off I explained what we were going to do and then handed out bits of cardboard and bubble wrap. I had the students draw with markers shapes. It is better to keep the shapes simple as cutting cardboard is an imprecise science. After they had cut out their shapes, with some help, we spent some time arranging and placing the materials on the plywood which I had laid down flat. I use a staple gun to affix the material to the plywood but you could use glue if you want. I find that the staple gun speeds things up and gets the kids printing much faster. Once the materials are affixed I let the kids go wild with the paint. In groups of four they came up and did their worst. I encouraged the kids to paint over each others work and in general be as spontaneous as they want. Don't worry if they paint all over the wood as only the raised surfaces will print. Once the materials are really covered with paint you are ready to print. If printing on paper you might need to take some proofs and then re-ink. With cloth I have found that one inking will do. First place your inked plywood on the ground, a hard surface is better than say a lawn. Lay your paper or cloth on the inked plywood. Gently smooth it out and press down to make sure it is in contact with the raised and inked materials. Next place your second piece of plywood on top of the cloth and inked piece of plywood. Sort of making a sandwich where the bread is plywood and the cloth or paper is the cheese or bacon. Now the really fun part- Printing! 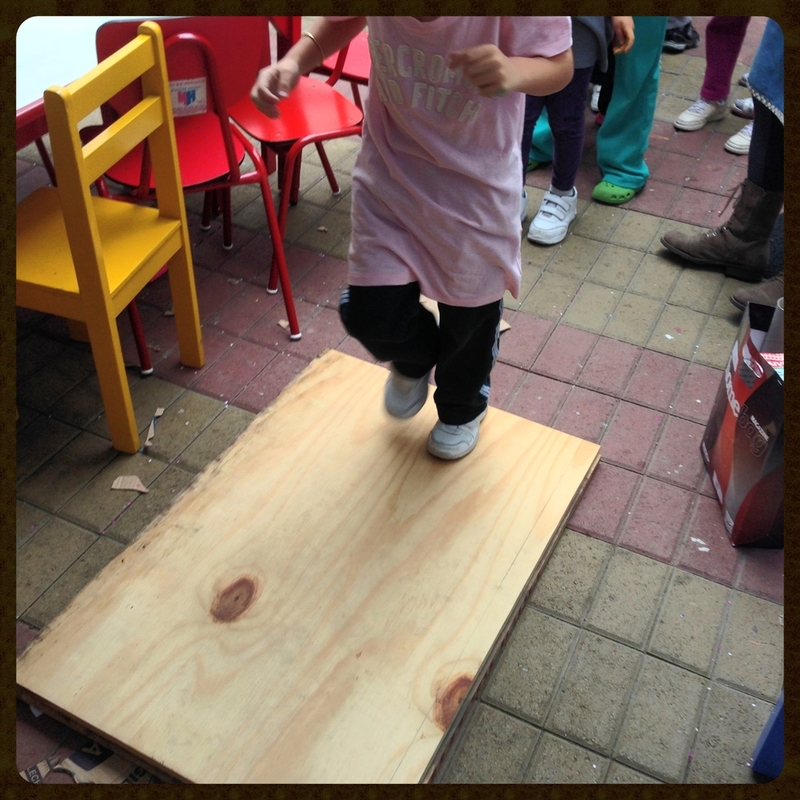 I had the students line up and then one by one they walked and jumped on the plywood sandwich. This prints the ink onto the cloth or paper. They can be as energetic as they want. I found that one time through the line of 24 kids was sufficient but if they are having fun ket them go again. They can really go at it they only thing to be aware of is that the plywood does not shift. Remove the top piece of plywood and peel the cloth or paper from the inked material by pulling from one corner. You should have a print of the inked materials. You now can re-ink or remove the materials and start over. Its up to you. 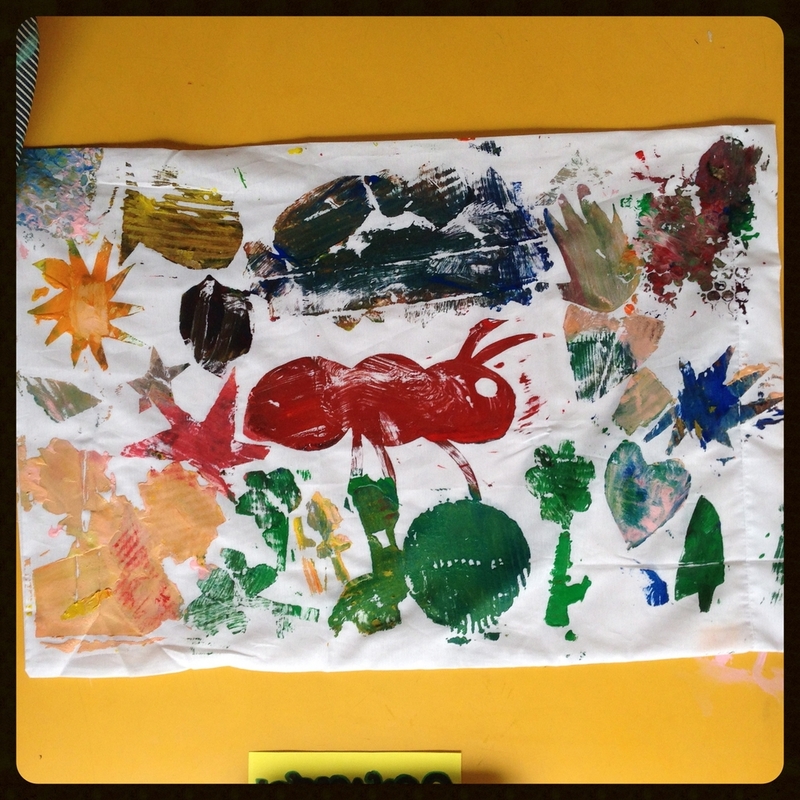 We had a great time and the kids nice and messy while making their first prints!